The effect of demonetisation is visible every where, from general people to a small shopkeeper, educational institutions to hospitals. After the general people now the Jail inmates starts approaching the Court for helping hand. Total 11 convicted inmates namely Madan Kumar, Dipen Kalita, Prafulla Das, Arup Sharma, Manoj Das, Md. Tamiz Ali, Md. Thakur Ali, Jogot Boro, Md. Safiqul Ali, Dipen Mahanta , Moon Das undergoing punishment of Rigorous Imprisonment for life presently lodged in the Guwahati Central Jail, Sarusajai, Guwahati approached Gauhati High Court seeking appropriate directions to the Respondents i.e. 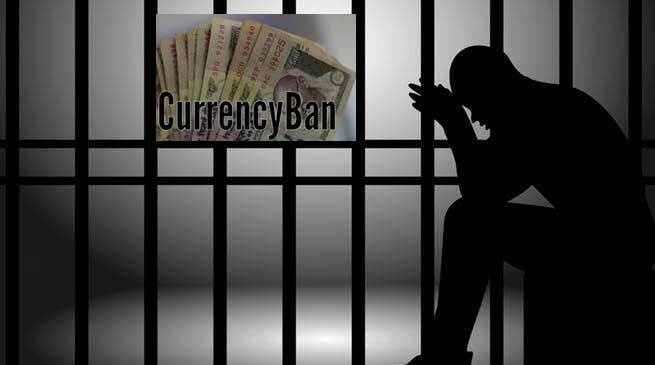 Central Government, State Government, Reserve Bank & Jail Authorities to make necessary arrangements to allow the prisoners to visit their respective banks and/or to go on parole for a few days so that they may visit their respective banks to operate their accounts and put a proper address of their ill fated demonetised money and seeking further directions to the Respondents more particularly Reserve Bank to provide facilities or arrangements by way of sending officials of the respective banks in the jail premises for exchanging the demonetised money available with the prisoners. It is relevant here that the Central Government vide the Notification dated 08.11.2016 introduced a demonetisation scheme vide notification No. S.O. 3408(E) which has been published in the Official Gazette of India. Under the notification, all currency notes of denomination of 500 and 1000 were de-recognised as legal tender with effect from the midnight of 9th November 2016. While prescribing the guidelines the concerned respondent authorities have failed to enumerate any provision for jail inmates like the petitioners for exchanging their old currency notes of 500 and 1000 denomination, which they have, as their cash in hands. Clause 2 (v) of the notification spells about tendering deposit of specified bank notes to be credited to an account of third party to a maximum limit of Rs. 50,000/-. It has become a great hassle for the prisoners who have been confined in jail, to deposit their cash in hands who have got more than Rs. 50,000/- demonetised currencies as the family members could only deposit an amount upto Rs. 50,000/- in the respective accounts of the jail inmates. Mr. Amit Goyal , Advocate appearing for the inmates before High Court said that until and unless arrangements as regards to the exchange or deposit of cash in hands of the prisoners which has been demonetised by the Government not made prisoners will suffer from natural justice and biasness contradicting the provisions of the Constitution of India in respect of enforcing their fundamental rights. Not making arrangements for exchange of demonetised currencies of the prisoners amounts to denial of the equality before law or the equal protection as given to the Citizens of India under Article 14 of the Constitution of India. Mr. Goyal added that jail inmates are not in an equal position in comparison to others to operate their bank accounts in exchanging or depositing their demonetised currencies. Since the prisoners are not an in-equal status in exchanging or depositing their demonized cash in hands, they should be provided with some special procedure or mode which could facilitate them in exchanging or depositing their specified older currencies. Since as on date nothing has been done for the inmates , total 11 inmates of Guwahati Central Jail approached Gauhati High Court by way filing of writ petition seeking direction to the Central Government, State Government, Reserve Bank & Jail Authorities to make arrangements to allow the petitioners or any other victims to visit their respective banks and/or to go on parole for a few days so that they may visit their respective banks to operate their accounts and put a proper address of their ill fated demonetised money available their cash in hands and for further direction to Reserve Bank to provide facilities or arrangements by way of visit by officials of the respective banks in which the petitioners hold their accounts and collect the demonetised money available with inmates. Alongwith Mr. Goyal, Mr. Arunabh Choudhury , Advocate is also appearing for the inmates before the High Court.